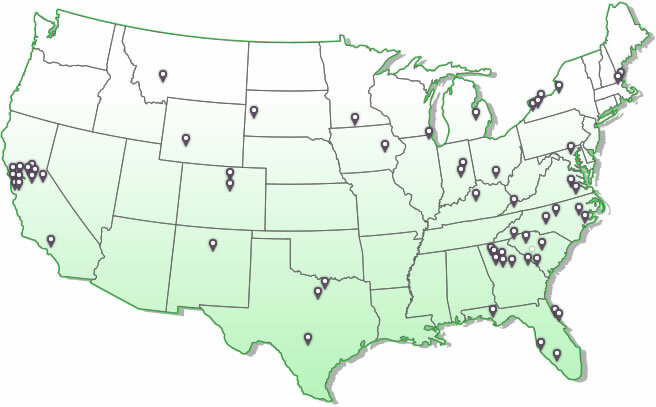 Click on a U.S. state marked with a pin to see installations. 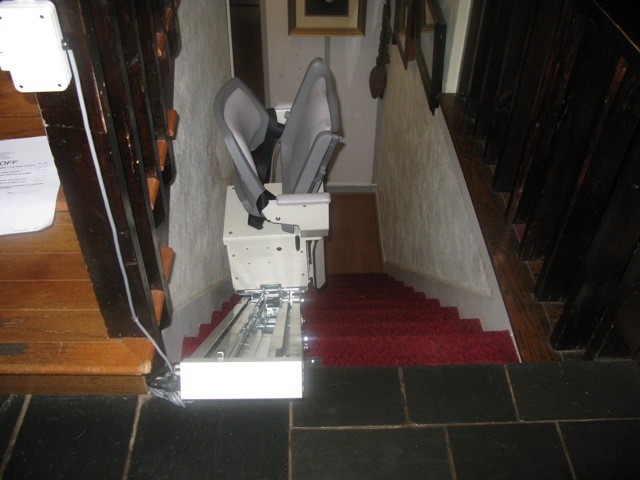 We're always seeking photos of our stair lifts being used in our customers' homes. 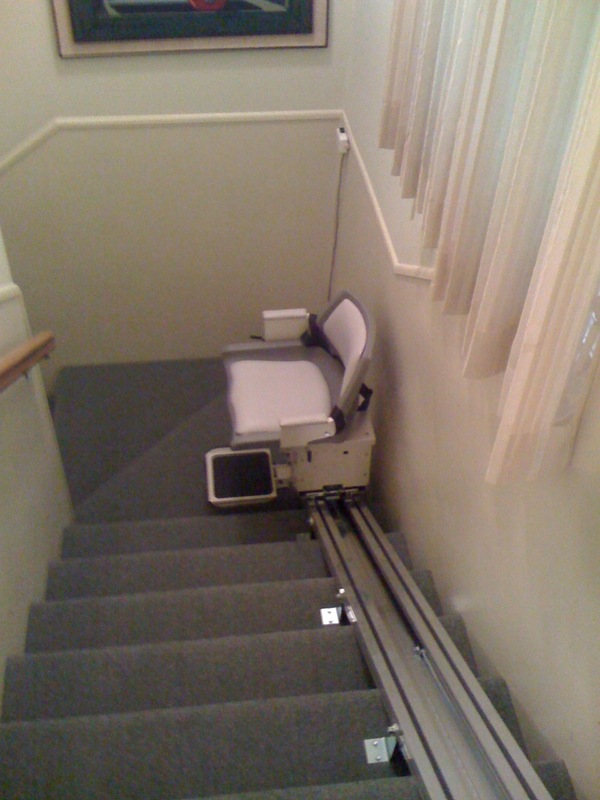 If you purchased an AmeriGlide or Summit stair lift from A1 Medical Supplies, email us with your photos of your stairlift - we might want to feature them here on this page! 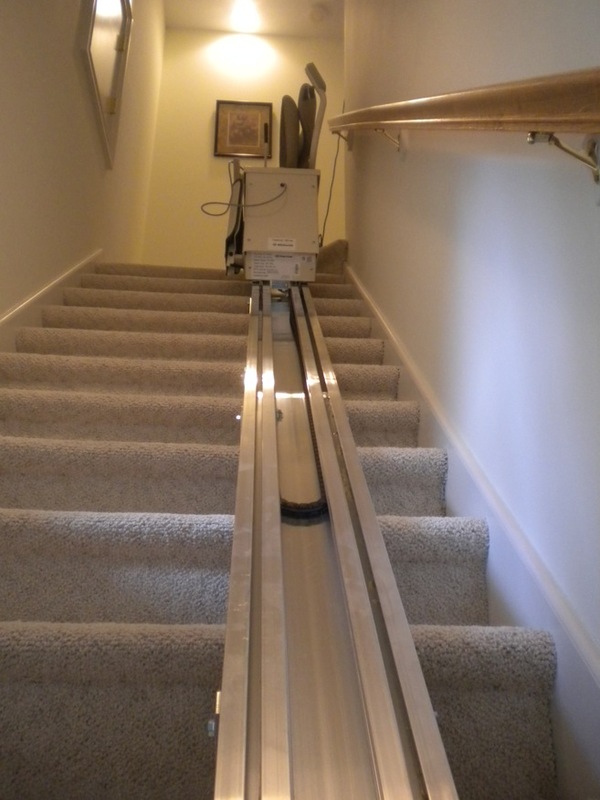 Barbara in Lakemont, GA sent us a few photos of her newly-installed AmeriGlide stair lift. Here you can see how the lift seat folds up when not in use, allowing for safe and convenient passage around the stairlift unit. 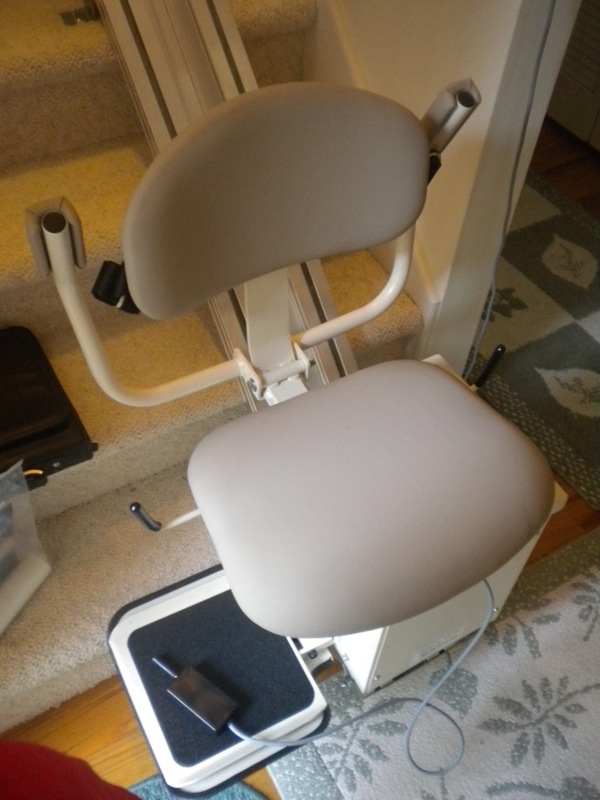 Daniel in Simpsonville, SC contributed a few snapshots of the AmeriGlide Deluxe stairlift which was recently installed in his home, and it looks like the technician did an excellent job! These photos are a good demonstration of how stair lift tracks should be aligned when properly placed and bolted. 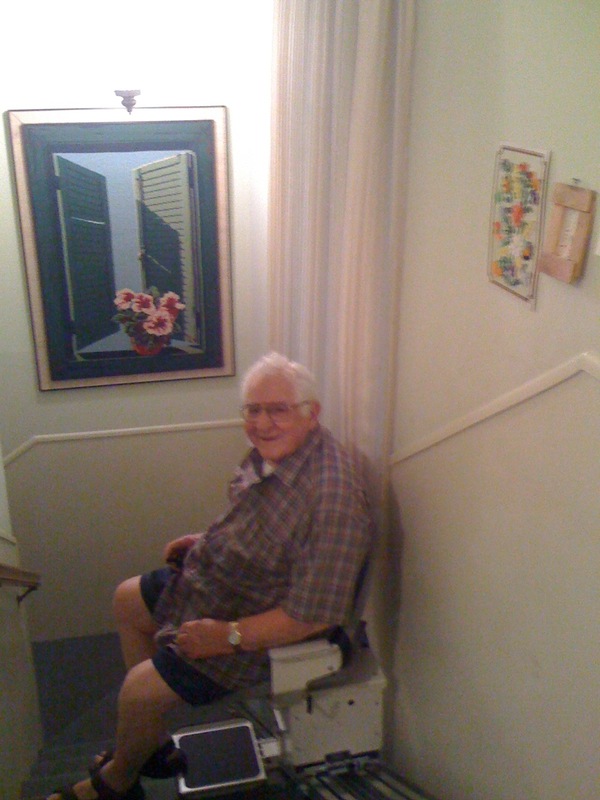 You may recognize this shot of Hal in Palm Coast, FL from our Stair Lifts page, riding his AmeriGlide outdoor stair lift. 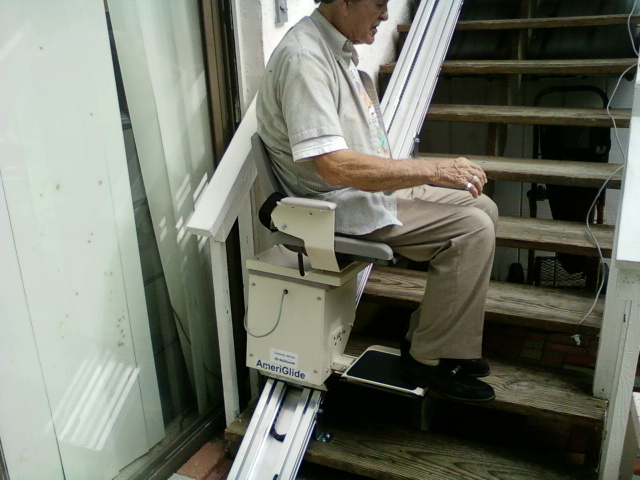 We wanted to include a second shot here, showing how his stairlift connects him from his sliding glass door on the ground floor to the porch off his second story door. Remember to put that cover on before the rainstorms come, Hal! 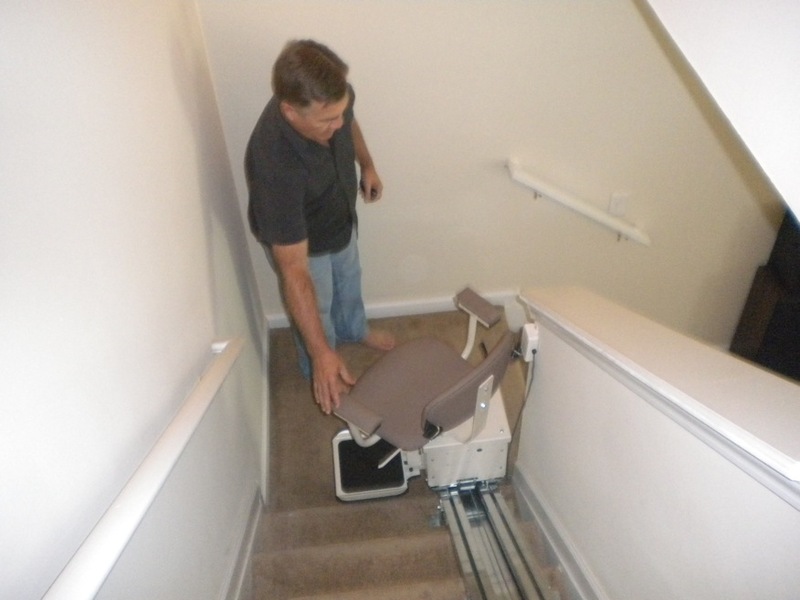 Here's some more shots of an AmeriGlide Deluxe stair lift in action from John in Salem, SC. 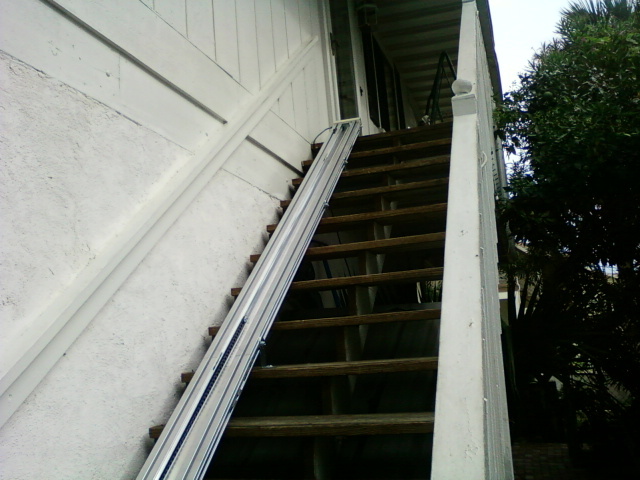 These photos illustrate how a stair lift can be used as a supplemental aid for people who still retain partial mobility. John's lower landing, which has fewer steps leading up to it, doesn't have its own lift system (though it does have a safety grab bar), but the longer and steeper portion of the stairway does. 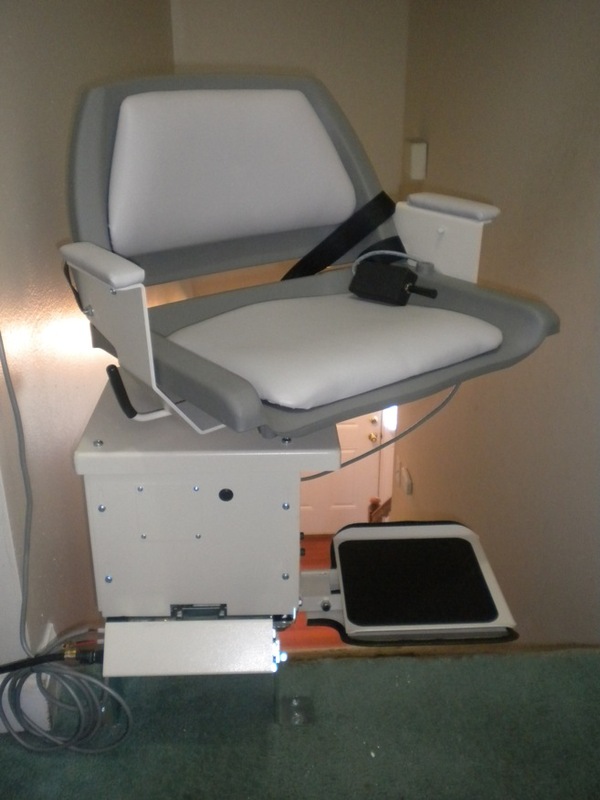 Louis in San Antonio, TX chose AmeriGlide for his stairlift needs, and wanted to send us some shots of it - with and without a model in the seat! 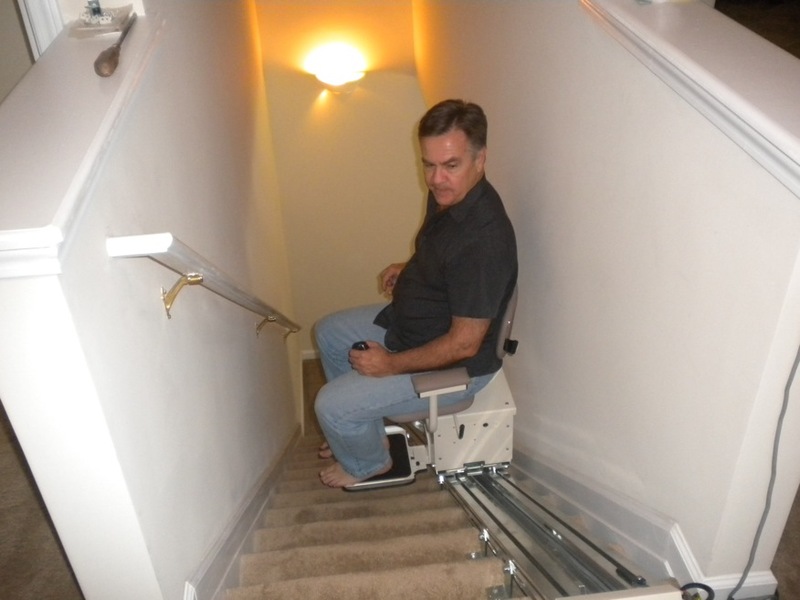 While we recommend that users always keep their feet securely in place on the footrest when operating the stair lift, Louis apparently has faith in AmeriGlide's safety engineering and knows that if his flip-flop gets caught beneath his footrest, the safety sensor will force the lift to stop moving. Thanks for the great photos, Louis! 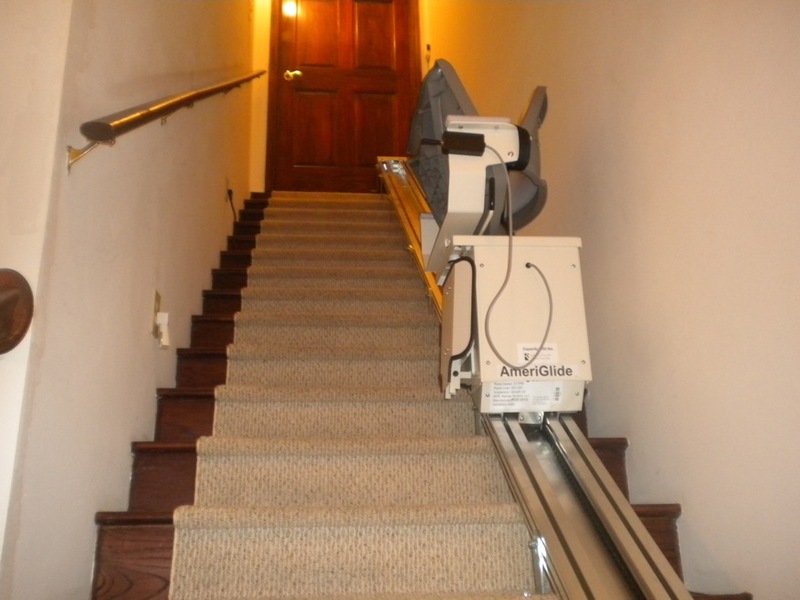 We received this photo of a newly installed AmeriGlide stair lift from Philis in Lebanon, VA. Here you can see that Philis had her call-send controls mounted on the bannister near the top of the stairs for easy access and push-button convenience! 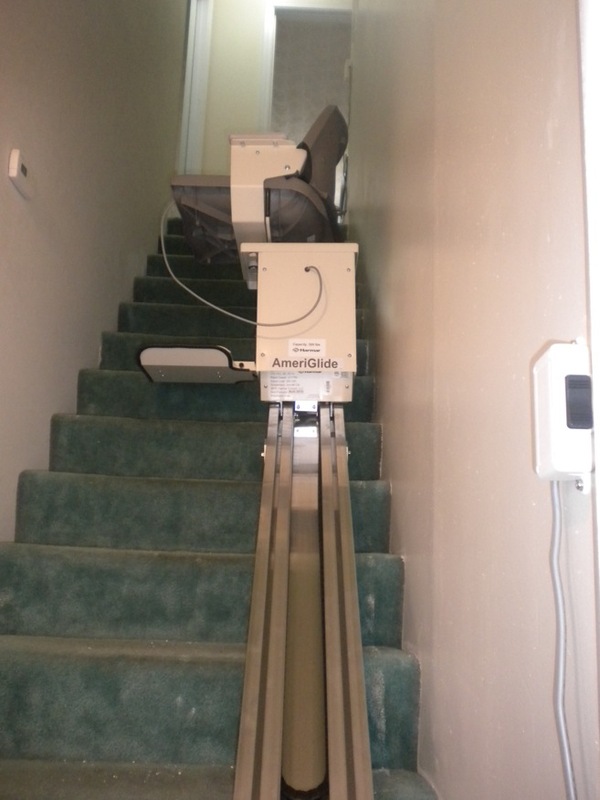 Sharon in Atlanta, GA contributed these pictures of her new AmeriGlide stair lift. As you can see in the photo, Sharon's staircase is very narrow, and this is an excellent demonstration of just how space-efficient AmeriGlide stairlifts are.